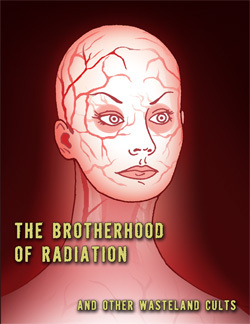 The Brotherhood of Radiation and other wasteland cults. This book is the latest in a "series" of character-oriented Darwin's World sourcebooks, a line of GM and player reference tools intended to bring out the flavor - and potential - of the eleven Backgrounds of the Darwin‘s World role-playing game. The first such book of this type was the combined Foundationists/Metal Gods sourcebook, which highlighted the leading Guardian/Resurrector/Advanced factions of the Twisted Earth setting. These two books (later combined into one) introduced new advanced classes, feats, equipment, and even a new playable race, the android - all material with a decidedly "high-tech" feel. The next, The Broken And The Lost (which detailed the Brethren), included a more in-depth look at the Feral, Primitive, and Resentful background options, presenting new rules and options intended to level the playing field for these often-underpowered character types. In "Wasteland Cults" we will take a look at the Twisted Earth's most prominent "cult", the Brotherhood of Radiation, and a sideshow of weird, wacky, and sometimes fascinating freaks that are the Twisted Earth's other "religions". This book, then, is "dedicated" to the Ritual Preservationists.